The number one animated video creation platform used by teachers and students in the classroom. Kids And Teachers Give the GoAnimate for Schools App on Edmodo an A+! GoAnimate for Schools recently released an app within Edmodo, and our class has been loving the new tool! 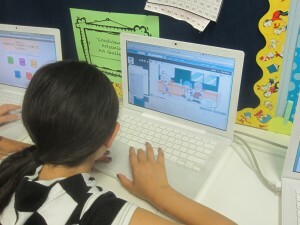 Within Edmodo the students can open the GoAnimate app, and make their very own cartoons. The way that it is set up makes it really easy to start using, but at the same time there is always something new that we learn each time we make a cartoon in class. When starting, the app gives you the option to make a quick video or a full featured video. When we first started using GoAnimate we used the quick video option, but as we practiced we began using the full featured option. Using the quick video is a little more limiting, but it is a great way to start using the program in the classroom. With the full featured video students can move their characters around the screen, make multiple scenes, create their own character, and so much more. The first day we used GoAnimate we ran into a problem. With our version of Firefox the students were not able to use the microphone in the computer to record their own voice. Instead the only option was to type their text into the program and have a slightly computerized voice act out the lines. Using this had its benefits however, the students were able to choose different accents, and could make their characters sound male or female. When I polled the class after our first attempt there was an overwhelmingly agreement that this was one of the downsides to the app. They all really wanted to record their voice. I discovered that for some reason if we use the app in Safari as opposed to Firefox, the students were able to record their own voices. Since being able to do this the students have really been loving making their videos. When the students record their voices they are able to speed up or slow down the tone of their voice which they think is funny. This feature is also useful, because students can make characters that sound different. Go Animate is a great was for students to share what they have learned about different topics. It is quick, easy, and looks amazing. In class we have used it to discuss field trips, review various topics, and we made anti-bullying videos (one of the students’ ideas). The students are even able to make videos from home and post them to our Edmodo page. I am constantly looking for new ways to use this great program, and if I find any more ideas I will post them here. Here is a link to my public Edmodo page, I will add different examples of projects as we complete them. To learn more about GoAnimate for Schools visit http://goanimate4schools.com. Are you using GoAnimate for Schools or GoAnimate in an interesting and engaging way in your class, or know someone who is? Are you interested in guest posting for us? We want to hear about it! Email EdEx@GoAnimate4Schools.com, tweet at us (@GoAnimate) or send us a message on Facebook. GoAnimate for Schools Supports Leadership in the Classroom… in Brazil and Beyond!